Well Glogirly FINALLY took time out from her busy yeah right schedule of touring the national parks with Gloman to send me a postcard. Not sure I can say it's the *thought* that counts. Who exactly do you suppose these animals were sticking their tongues out at anyway? Certainly not ME. Gloman's the one with all the camera gear. Enough said. We do find it curious that those critters are stickin out their tongues in the pics sent to you! Are they saying "Hey Glo people...get your rears home to Katie"??? The Woman used to send postcards to her cats. As if they cared... really. Pfffftttt! They aren't too impressed with having Gloman taking their pictures, eh? Hmmm. On the one hand, better than nothing. On the other, lame-o. And this is supposed to be funny? I think you need to think up some "funny" tricks for when they get back... and you know we kitties have a VERY different sense of humor. Sounds like a great trip they are having. But those are savvy animals. Love the captions! Those are a couple of rude beasts giving the raspberries! Guess they don't like the flashy box either! So, Glo-man photographs TUNGZ? This gets weirder and weirder. OMG THOSE PHOTOS ARE INSANELY HILARIOUS!!!!!!!!!!!!!!!!! I know Katie I'll get into my closet and come and see you! Oh she is gonna be sorry! Is Glogirly in my neck of the woods? She could have come and seen Pricilla stick out her tongue for you Katie! Those Glopeople are such nervy peeps. Why you oughta … I voted for you on that other contest that TW entered me in before she read the rules that she'd be responsible for getting me to the photo shoot. Make my day, Woman! Katie, you are lucky! I didn't even get a postcard when my Mommeh left me! That is very rude of them to send you postcards of animals sticking their tongues out. We hope you have a good revenge planned. Very strange! At least she thought of you....we never get postcards. 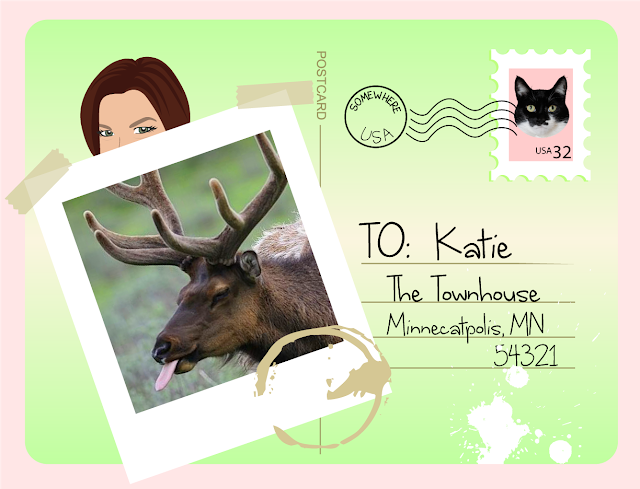 Katie, maybe those animals identify with your plight, and are sticking their tongues out at Glogirly and Gloman? Me has been to Glacier Park! It is in Montana and just south of Waterton Park! Me lives west of there on the other side of Idaho! Wes went to Calgary once that way! 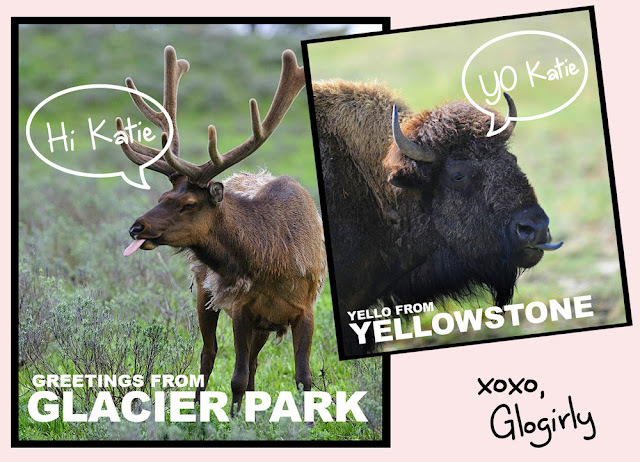 Too bad the Elk and the buffalo was giving Glogrl and Gloman the raspberry. Was it cuz they did not gives them apples?